Autopilot and Signals Processing is an approach to test whether applicants are prepared to deal with multiple tasks simultaneously and still efficiently. 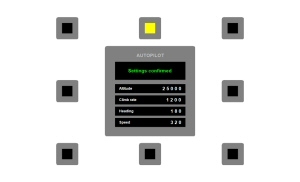 Autopilot and Signals Processing compiles two concurrent tasks. The primary task requires test takers to enter incoming new information into an autopilot interface. The coeval secondary task is to respond to (cancel) visual alert signals that will surface at random intervals.